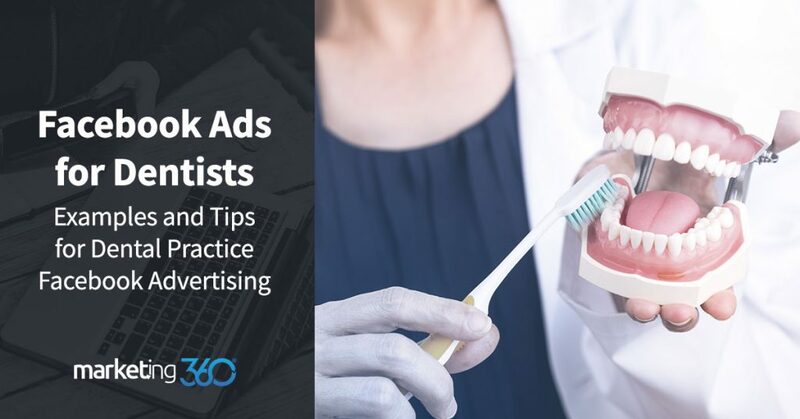 Does your dental practice need to get more new patients through Facebook Ads? Here are some tips and examples. They incorporate the human element. People can visualize the problem or solution. The ad appeals to people’s emotions. Let’s break down why this ad is effective. Facebook is, to be sure, a social media platform. Social means people. 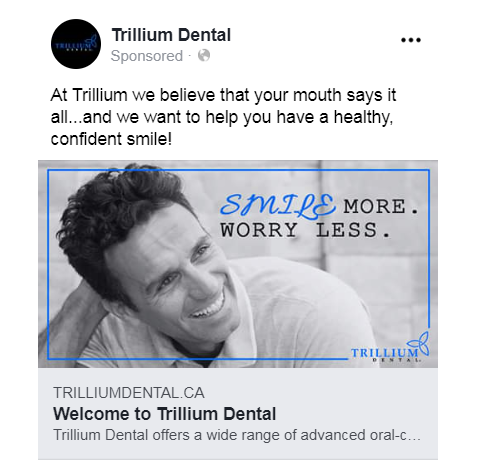 Facebook reports that maintaining a human element – which basically means using human faces – makes for a more engaging ad. 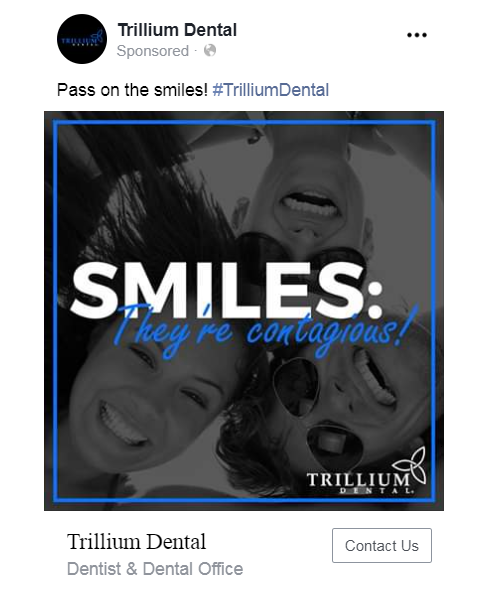 We also employ the tactic of using faces in website designs, but for Facebook ads, it’s even more important. We are naturally drawn to human faces. 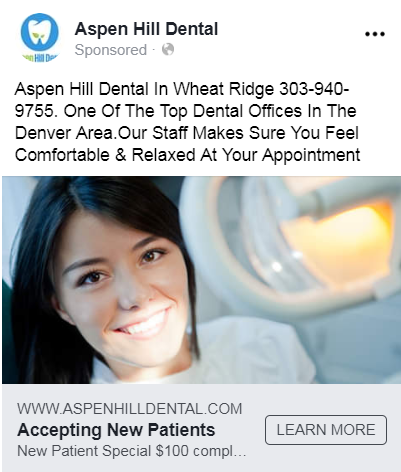 The smiling face of a patient (real or a stock photo) will draw people’s attention to your ad. Putting person into the ad also makes the content more relatable, which in turn makes the ad resonate better with your audience. Another effective trick for Facebook Ads is to help people visualize the benefit of your offer. For dentistry the best images to use are like the one in the example ad – the happy face with a healthy smile. Furthermore, in that picture, the woman is in the midst of a successful, low-stress checkup. Just how you want prospective patients to visualize themselves in your office. The 52 ads tested used 3 creative approaches: emotional, rational and mixed. Emotional ads scored best in 4 of the 6 categories analyzed, including message clarity and purchase intent. Mixed ads, which incorporated emotional elements, scored best in the other 2 categories (relevance and likeability). Rational ads, which highlighted things like functional benefits and sales offers, didn’t score best in any of the 6 categories. In our example ad, the practice talks about how they make patients feel “comfortable and relaxed”. This message is re-enforced by the image. 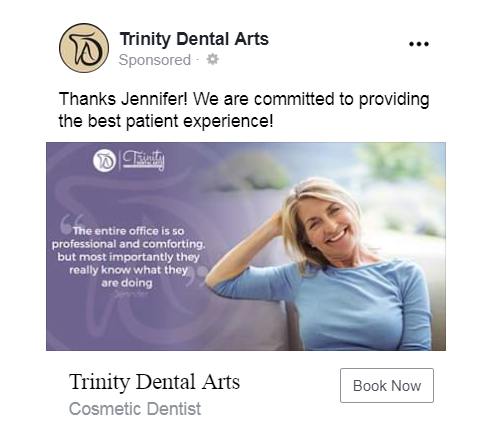 For dental Facebook Ads, you want to create a sense of comfort, relaxation, trust, and professionalism. Since these are ads, you want a clear call to action that moves your audience closer to scheduling an appointment. 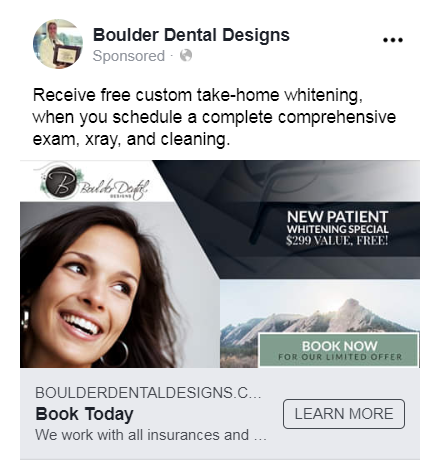 Most Facebook ads for dentists will be a website link that takes people to a page where they can contact you or schedule an appointment online. Notice how the image of the woman is directing her gaze towards the new patient call to action, which gets people to look that way in their Newsfeed. For a call to action, a new patient or other procedural special offer are effective at engaging new patients. 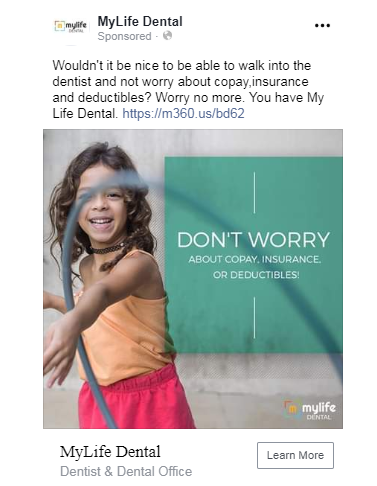 Here are a few more Facebook ads for dentists to inspire you.